The biggest cemetery in Red Bank, New Jersey, is named Fair View which strikes me as funny. The name chosen is damning by faint praise—the view isn’t bad, it isn’t great, it is just “fair”. But what’s in a name? The cemetery is beautiful, set in a neighborhood on gently rolling hills and landscaped in the tradition of some of the first rural cemeteries. 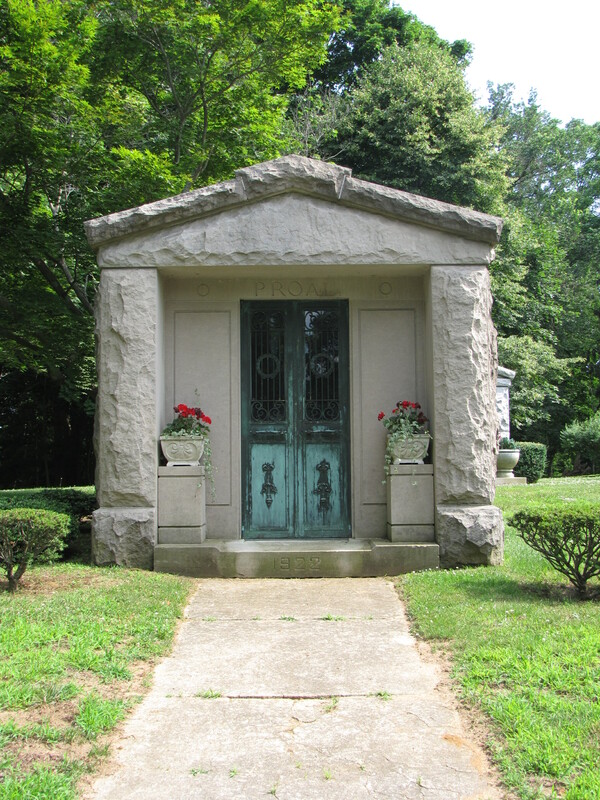 At any rate, Fair View Cemetery has several mausoleums within its gates, including the the Proal Family Mausoleum. The mausoleum is fairly modest, built in a rustic rough-hewn style. The exceptional feature of the crypt is the stained glass window on the back wall. 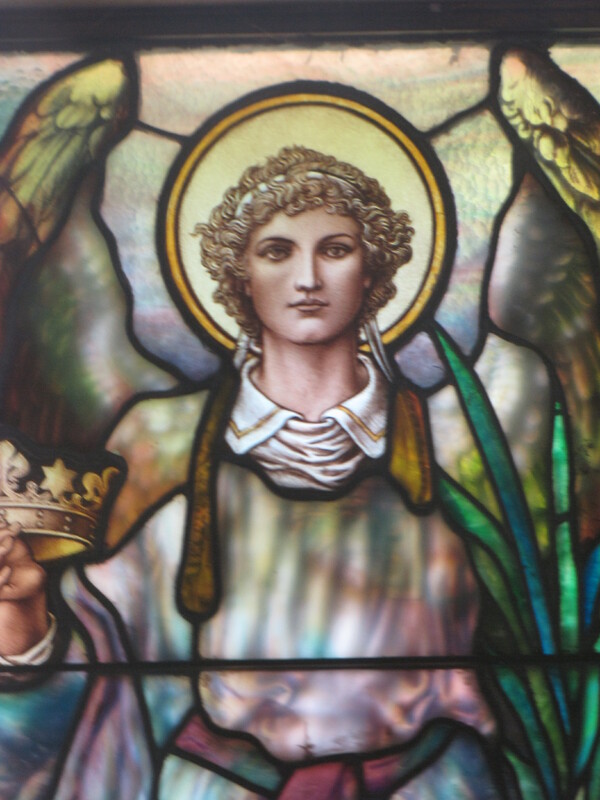 Adorning the window in shimmering blues, purples, greens, and cocoa is a glass angel depicted holding a crown, as if it is going to be offered to a recently arrived soul to Heaven. The crown is a symbol of glory and reward and victory over death. The reward comes after life and the hard-fought battle on Earth against the wages of sin and the temptations of the flesh. The reward awaits in Heaven where the victor will receive a crown of victory. The crown also represents the sovereign authority of the Lord. 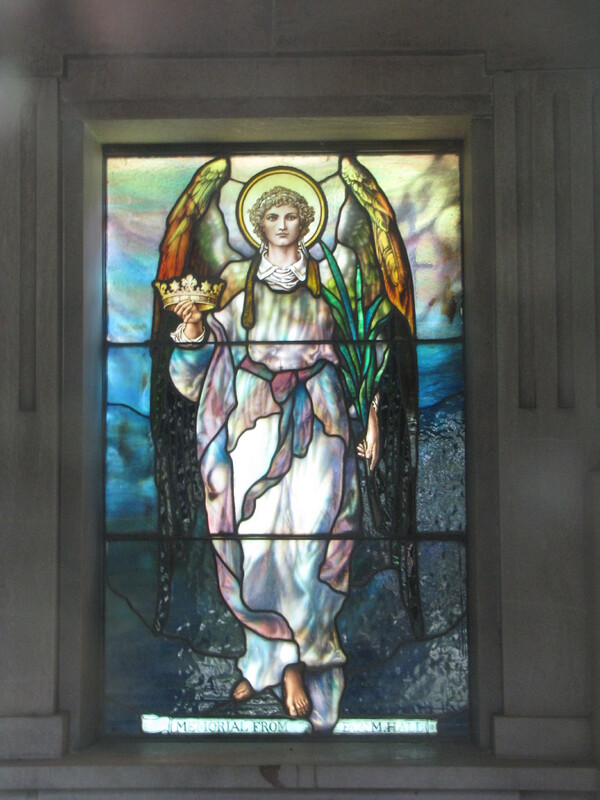 In the angels other hand, the angel holds a palm leaf. This symbol is most closely associated with Easter, and Jesus’ spiritual victory over death. The palm frond is also a symbol of eternal peace.